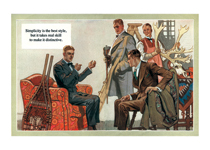 Telling his friends about his exploits in the sporting field doesn't mean that this young man has abandoned his determination to be well dressed in Schaffner & Marx clothes, of course. The illustrations in this series, made by Herbert Paus for the Hart Schaffner & Marx clothing company, demonstrate his bold and graphic style. 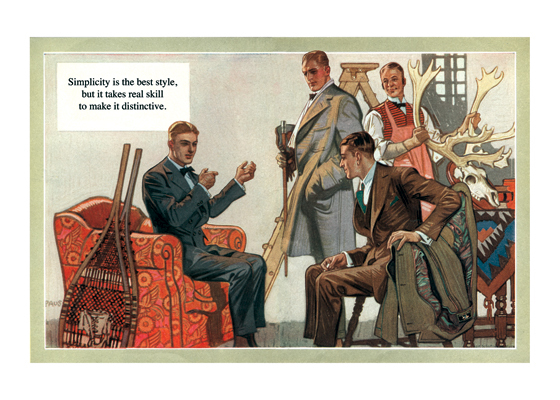 They also convey a feeling for the mood and ambitions of the well-dressed man in the early 1920s. Herbert Andrew Paus (1880-1946) was a noted American illustrator working in the first decades of the 20th century. He both created posters himself and supervised other artists to help the war effort during World War I. He also illustrated books and painted cover art for magazines such as Colliers , Ladies' Home Journal and Pictorial Review .